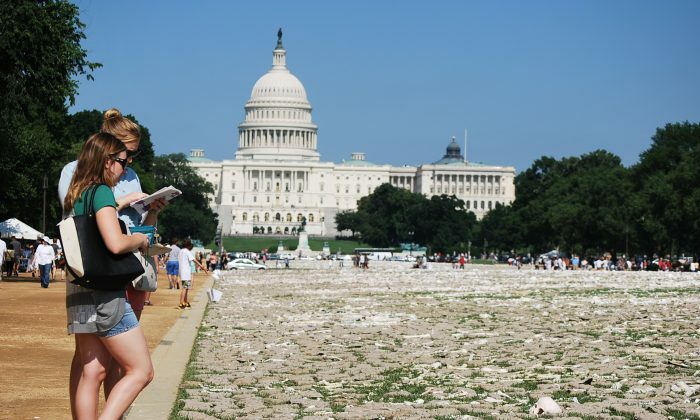 WASHINGTON—A million human bones, crafted by artists, students, and educators from around the world were displayed on the National Mall from June 8 to June 10. The bones, made of clay, plaster, and paper, symbolize the real bones of victims of genocide and mass atrocities in Burma, South Sudan, Somalia, Syria, and the Democratic Republic of Congo, according to the group that organized the exhibit. The figurative graveyard was a visual petition to ask U.S. lawmakers to act to end genocide throughout the world. Students Rebuild, which, according to its website, mobilizes young people to learn and take action on critical global issues, connected young people in the United States and in 30 countries to the One Million Bones challenge. Artist Naomi Natale led the project. The challenge offered educators a way to broach the topic of genocide with their students, and help students to understand the ongoing conflicts in Africa. Students communicated with guest speaker, people who survived conflicts, and other students in Somalia and the Democratic Republic of Congo through video chats. For each of the bones crafted by students and educators, the Bezo Family Foundation donated $1 to CARE for up to 500,000 bones, to support CARE’s relief and rebuilding programs in Somalia and the Democratic Republic of Congo. Survivors of the war in Africa also participated in the One Million Bones challenge. “In 1993, I was six year old when a deadly civil war broke out in my country. My family decided to flee to the neighboring ex Zaire (Democratic Republic of Congo). Burundian refugees were packed into camps where life was hard: no food, no medical attention, no potable water. During the first months, thousands of refugees died of hunger and diseases especially cholera. Soon after, many humanitarian organizations among them HCR and CARE International came to rescue us. It was a huge relief for us,” said Nzoyisenga Fikiri from Bujumbura, Burundi, Eastern Africa in an a email sent to Students Rebuild and posted on its website. Fikiri shared the initial difficulty that he had getting members of his community to participate in the One Million Bones Challenge. “When I decided to do it myself, many called me crazy especially when I was manipulating gray to make bones. Soon after, some four friends and members of my family joined me and we finally made 131 bones,” he said. Renowned humanitarians supported the event. Nobel Prize winner, Archbishop Desmond Tutu shared his thoughts on the challenge in a video posted on the project website. “Bones are evidence of a unique individual journey: each moment of hope and happiness, each dream and passion, each struggle experienced in a lifetime … when you lay down these bones with us, it is my hope that these bones will transform us, bringing us to a place of better understanding and compassion and inspire us to act,” he said. Evan Kim, a student in Los Angeles did just that. He made bones at a Student’s Rebuild event in Los Angeles. “ I’m here making bones, because I care about the issues. … I’m one in a million because I care about people and I think that makes the world a better place to care about people and have compassion,” said Kim in a video posted on You Tube. An estimated 2,000 to 5,000 volunteers dressed in white, a color of mourning in parts of Africa, laid the bones constructed by Kim and people all around the world on the National Mall. Former Congressman Tom Perriello spoke at the keynote on June 8 on the National Mall. Anti-genocide activists John Prendergast of the Enough Project, Carl Wilkins, and holocaust survivor Eva Kor spoke at a candlelight vigil on June 9.